Fine, dry and sunny weather over the last few days has resulted in good progress at the High Pastures site. We have recovered some exciting finds from the Trench 2 extension and have exposed two large granite slabs below the hearth settings. These may be the roof slabs covering the original passage into the cave. Read on for news of these discoveries. Fieldwork at the High Pastures site has continued over the past week with the excavation of Trench 3 and the Trench 2 extension. With the exception of a few finds from Trench 3 including sherds of pottery, fire-cracked stone and fragments of charcoal, we have little to report on this trench. However, the extension to Trench 2 continues to provide some exciting finds and features. 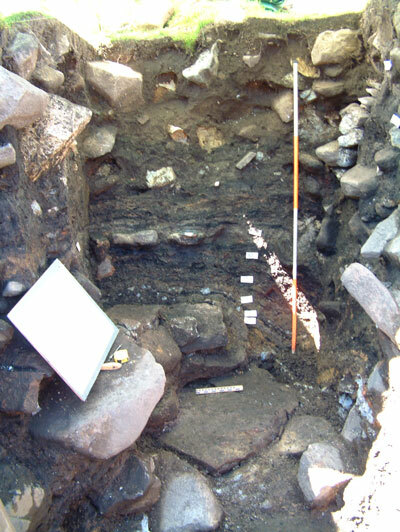 The image above shows one of the hearth settings under excavation in Trench 2. The small scale (0.25m) is located on one of the large granite hearth slabs and the yellow material beyond is lenses of peat ash. The complex sequence of deposits in the sections of the trench extension can be clearly seen, which include charcoal-rich layers, some of which contain calcined (burnt) bone. These lenses of material dip sharply to the right of the trench, spilling over buried stonework. 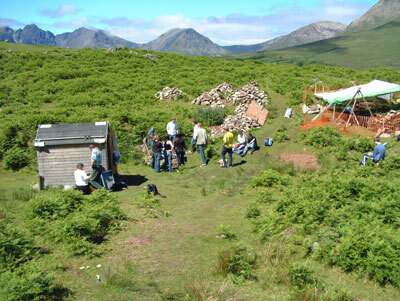 Several important finds were made in this area during the excavation of these features including pebble hammers and grinders, antler and bone artefacts, a stone spindle whorl and numerous finds of well-preserved animal bone and shellfish remains. Details of these finds including images can be found in the Latest Finds Page. All of the artefacts recovered from Trench 2 have been plotted three dimensionally, so we can review their distribution by context and position in relation to each other. The distribution plan below shows the finds recovered from Trench 2 above context C206, the clay-like layer that had been used to ‘seal’ and level the dumps of material that had been used to backfill the area above the former entrance into Bone Passage. The ‘shaft boundary’ indicates the cut in the original ground surface made for the entrance, while the ‘funnel boundary’ shows where the natural ground surface falls away to form the original sink-hole for the cave. The second distribution map shown below indicates the find spots for artefacts recovered from contexts below C206. 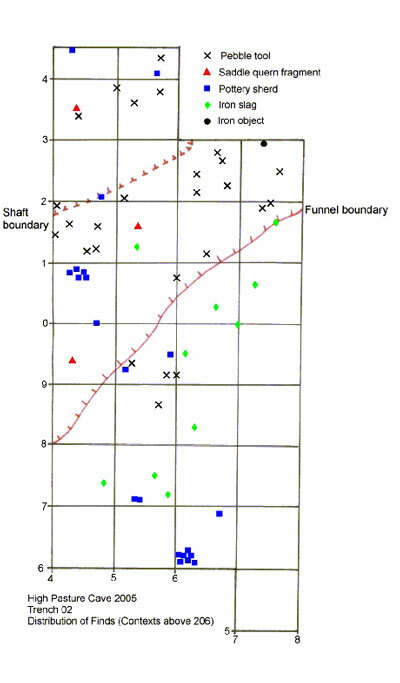 No finds are shown outside the ‘funnel boundary’ on this map because the contexts here have already been excavated down to the natural ground surface. 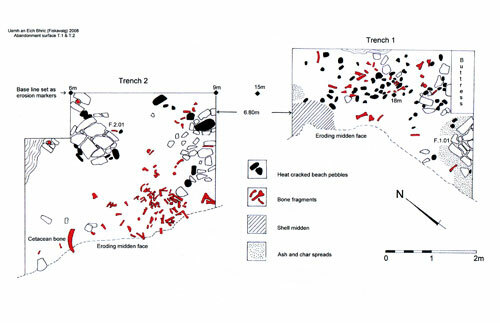 It can be seen from these distribution maps that most of the pebble hammers/grinders and the saddle quern fragments are grouped primarily within the ‘funnel boundary’, which includes the backfill for the original entrance pit. However, with depth these types of artefact are grouped in an area immediately above the original entrance to the cave. Finds of bone and antler are also grouped in this area, suggesting that this location had some special significance for the prehistoric inhabitants of the area. By Tuesday 28th June we had been successful in excavating the three superimposed hearth settings in the Trench 2 extension and we uncovered the remains of a low and coarsely-built wall, surviving to a maximum of three courses in height. Finds of animal bone and shellfish remains became more numerous in this context and we eventually uncovered a setting of large granite slabs. These were quite level and jointed together, while immediately above them we uncovered a thin layer of reddish clay rich in calcined bone. The image above shows the low wall lying over the granite slabs. Small black voids could be seen between the open joints between the slabs and if are initial interpretations are correct the slabs could be the roof lintels covering the former entrance into the cave. After recording the low wall we shall excavate this feature to reveal more of the slabs, to find their full extent within the trench extension. During our work on site over the past couple of weeks we have received visits from local and visiting people to Skye, while on Tuesday 28th June we had a visit from teachers and pupils from the sixth form classes at Portree High School. They received a guided tour of the excavations and investigated some of the geological features that are important in this area of the island. The image above was taken during the school visit, which was blessed by excellent weather. 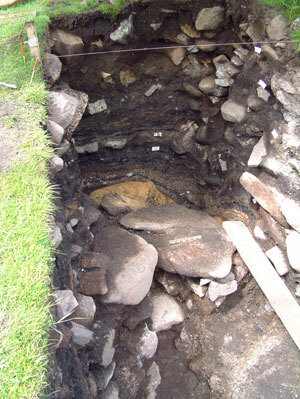 Make a return visit to the site over the weekend to see how we progress with the excavations.